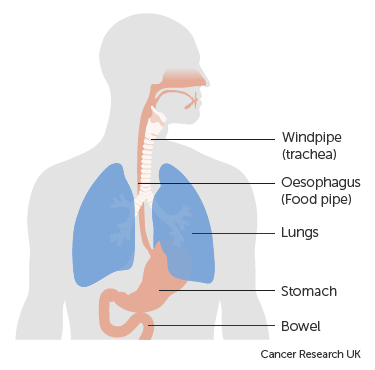 Food passes from the oesophagus into the stomach. It then holds the food and breaks it down (digests it) so our body can absorb it. It does this by producing juices and mixing the food up with them so it is easily digestible. Glands in the wall of the stomach make the juices. These juices are stomach acid and a protein called pepsin. They begin to flow as soon as we smell something. The muscle wall of the stomach contracts, churning the food with the juices, which changes it to a thick liquid. It takes a couple of hours for this to happen and then it moves into the bowel where the body absorbs it. Even when it is empty, the stomach continues to produce juices and hormones. So, to protect the lining of the stomach from the acid and pepsin it also produces a thick mucus. 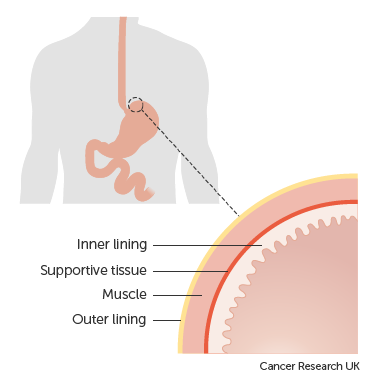 Cancer can start in any part of the stomach or the stomach wall. Your treatment can depend on where the cancer starts. Most stomach cancers start in the gland cells in the inner stomach lining. These are called adenocarcinomas. Some cancers can also start in immune system cells. This is called non Hodgkins lymphoma. Cancer can also start in the hormone cells in the stomach. These are called neuroendocrine cancers. The treatment you need if you have one of these types of cancer is different to adenocarcinomas. Stomach cancer is more common in older people. Around 50 out of 100 cases (around 50%) occur in people aged 75 or over. It is more common in men than women. Many stomach cancers are linked to lifestyle or environmental factors, including diet. 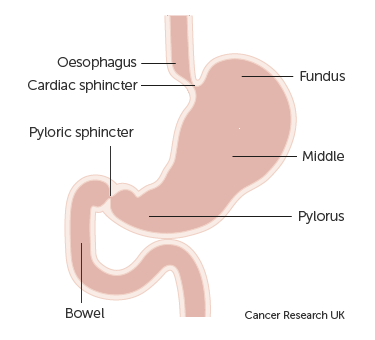 Stomach cancer is linked with a bacteria that lives in the stomach called Helicobacter pylori. But not everyone with Helicobacter pylori will develop stomach cancer.